Noe said the idea behind the book was to contact people researching Civil War and Reconstruction in Alabama today, and invite them to write on topics of their choosing. 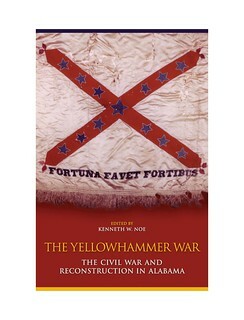 “Yellowhammer” was a nickname for Alabama Confederate soldiers. The symposium will conclude with a walking tour of Civil War era Auburn led by faculty and graduate students from the Auburn University Department of History, beginning at 2:45 p.m. In addition to the symposium, Special Collections and Archives of Auburn University Libraries is currently featuring its collection of Civil War documents related to the Hampton Roads peace conference, which took place in February 1865. The exhibit in Ralph Brown Draughon Library will be open from 9 a.m. to 1 p.m. the day of the symposium and 1-9 p.m. the following day. When the Hampton Roads Conference was convened, it was agreed that no formal notes would be kept of the proceedings. Therefore, the private papers of Hampton Roads Conference attendees, such as U.S. Major Thomas Eckert and Confederate Assistant Secretary of War John A. Campbell, have become extremely important in understanding why the Hampton Roads negotiations ultimately failed. For the complete schedule, list of presenters and other symposium details, go to http://www.cla.auburn.edu/cah/programs/yellowhammerwar/. The event is sponsored by the Department of History and the Caroline Marshall Draughon Center for the Arts and Humanities, both in the College of Liberal Arts at Auburn University.